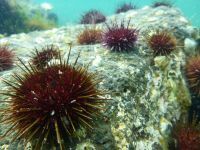 Monitoring of sea urchins in Port Phillip Bay over a four-year period has revealed that booming urchin populations and the barren grounds they created by overgrazing kelp beds are likely to persist in the long term unless drastic action is taken. High-density populations of the Australian urchin Heliocidaris erythrogramma have been monitored in Port Phillip Bay since 2009 by University of Tasmania and Reef Life Survey divers, after first being documented in the 1980s. New research led by Institute for Marine and Antarctic Studies (IMAS) researcher Dr Scott Ling, published in the journal Ecology, studied urchin growth and population dynamics at five sites in distinct regions of the bay and found the urchins have the potential for further future population growth and destruction of kelp beds. “Urchin populations can persist even after they’ve devastated kelp beds and created underwater deserts known as barren grounds, locking in the barrens for the long term,” Dr Ling said. “Our research in Port Phillip Bay found that high urchin populations persist across western and northern parts of the bay, with densities of up to 600,000 per hectare in some areas, the highest known urchin densities in Australia. “Urchins on the bay’s barren reefs have reduced body condition and growth, shorter longevity (of about six years), and are more prone to disease. “While it takes many urchins to create a barren, they can be maintained by relatively few, and the rate of juvenile recruitment on established barrens is high. “Quicklime is currently being used in Norway to cull urchins across all size ranges, and we are also exploring this approach on extensive barren grounds in Tasmania, where an estimated 18 million invasive sea urchins have created extensive barrens along the state’s East Coast. “Kelp beds provide habitat for an array of urchin predators, and there appears to be some resilience of persistent kelp beds to urchin overgrazing in Port Phillip Bay.